Artist KFiSH / Kelcey Fisher was born in southern Florida. (The name “Kelcey” meaning “one who dwells by the sea.”) Fittingly his home has almost always been by the ocean: First the Gulf coast, then the Atlantic, then the Pacific...through San Diego and ultimately here in Venice Beach where he made his first real impact in the mid-2000s splashing his colorful, frenetic pattern work and iconic portraits of friends heroes, in and along the places and paths of his community. His first admirers described his artwork as “Controlled Chaos”: on the surface, vibrant almost happy repeats of color but with a more complex and moody structure the deeper one chooses to dive. His work is informed by the vibrant colors of the beach culture with the underlying depth and turbulence of the sea. His aesthetic is energetic, approachable and memorable and translates seamlessly across various mediums; painting, photography, murals, product design, and collaborative projects. He uses each element to create an identifiable visceral experience that has become signature to his brand. He was awarded the artist in residence at the OLiVE in the Los Angeles arts district. 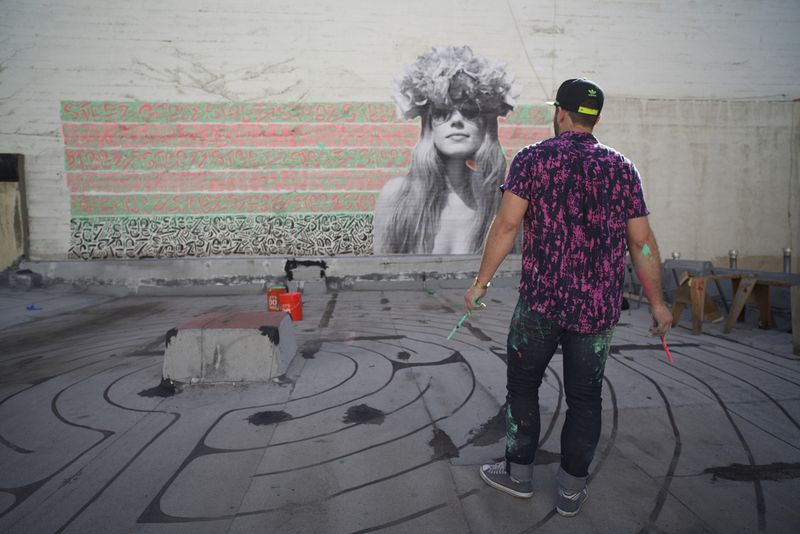 Most recently his work has been the subject of shows, the Rendon (Los Angeles), and cultural hotspots including FYF Fest (Los Angeles), Relic surf competition (Malibu), Superare (Melrose), first Fridays (Venice), Venice Beach Inn, Guisados tacos (dtLA, Echo Park), Misty Copeland Square (San Pedro), City Hall & Justice Tavern (San Pedro), Sweetfin Poke (Sunset & La Jolla), Attaboy Productions (Brooklyn), and Backyard Productions (Marina del Rey), with summer exhibitions planned for New York, Miami, and London. Product collaborations include four limited edition brews from Coronado Brewing Company & Goose Beer, Rip Curl, Toyota, three WINC wine labels, Funboy Rafts, Snapchat filters, and Community Made shoes. Artist collaborations represent an essential facet of Kelcey’s work. Some consistent collaborators include Ralph Ziman, Priscilla Witte, Vero Villarreal Sada, Kyle Boatwright, Kevin Brewerton, and Zachary Bennett-Brook.